As you may remember, we started a new feature this month. Each and every month, we will be picking a color of the month and a word of the month. 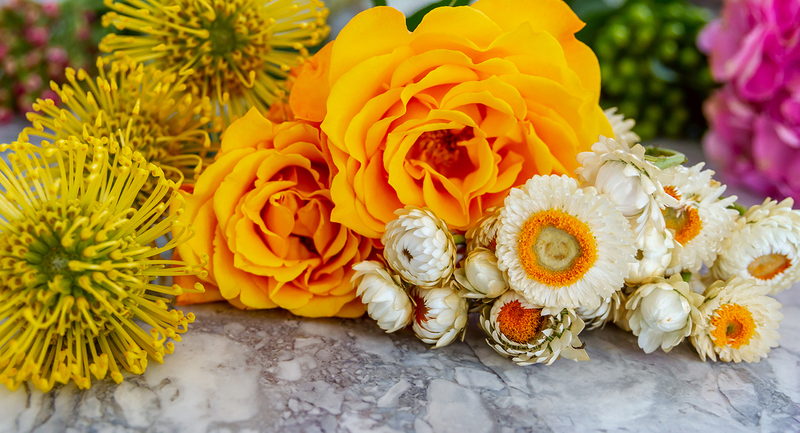 For September, our color of the month is yellow, and our word of the month is happiness. They go together quite well, don’t they? 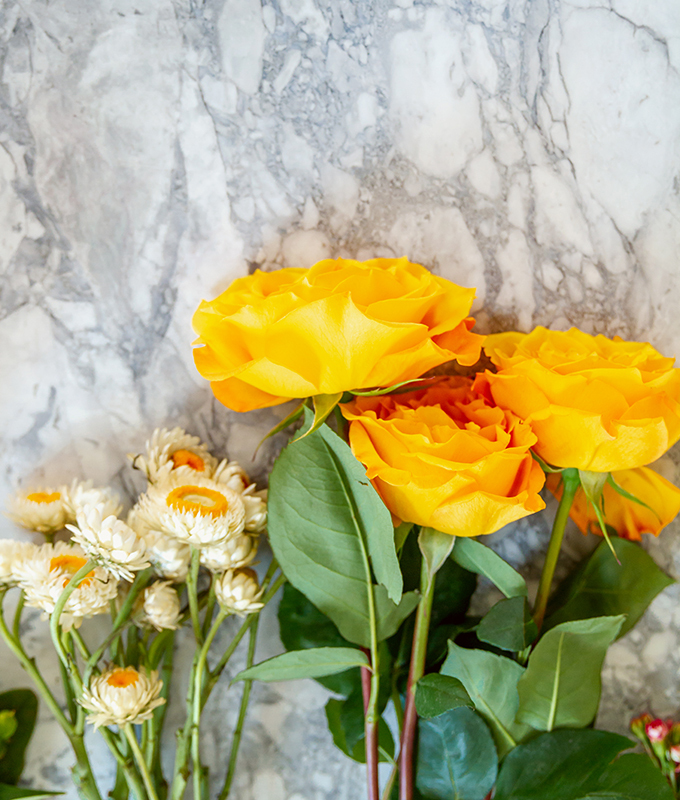 Well, as I thought about tangible ways in which I could bring more happiness into my life this month, flowers were the first thing that popped into my head! 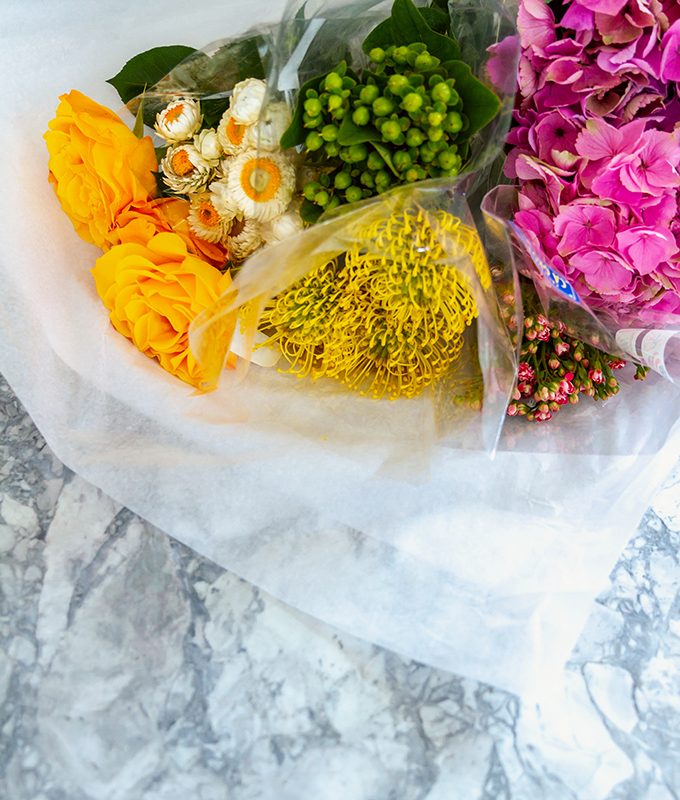 Who doesn’t love fresh flowers? 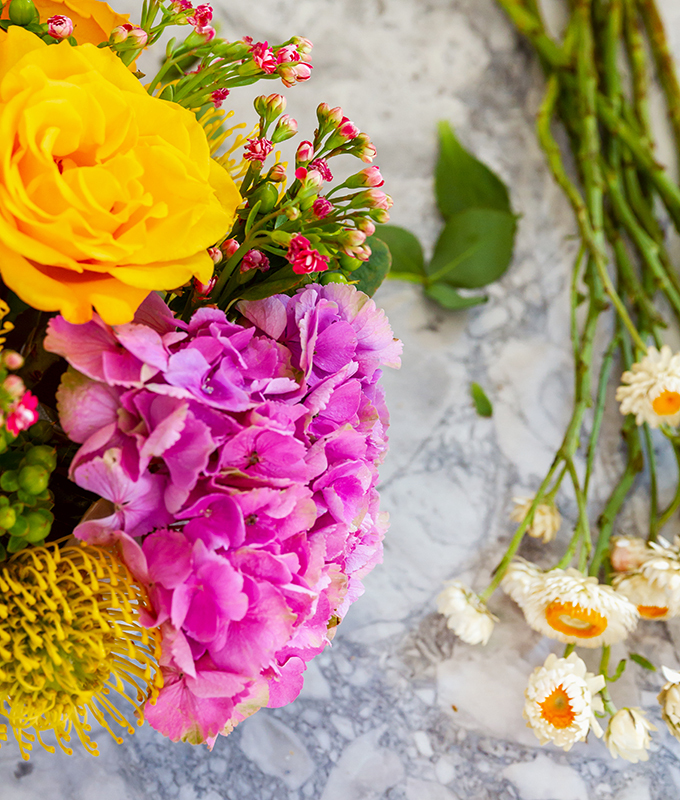 Whether a lavish arrangement or simple stems in a vase, flowers have the power to automatically lift our moods! 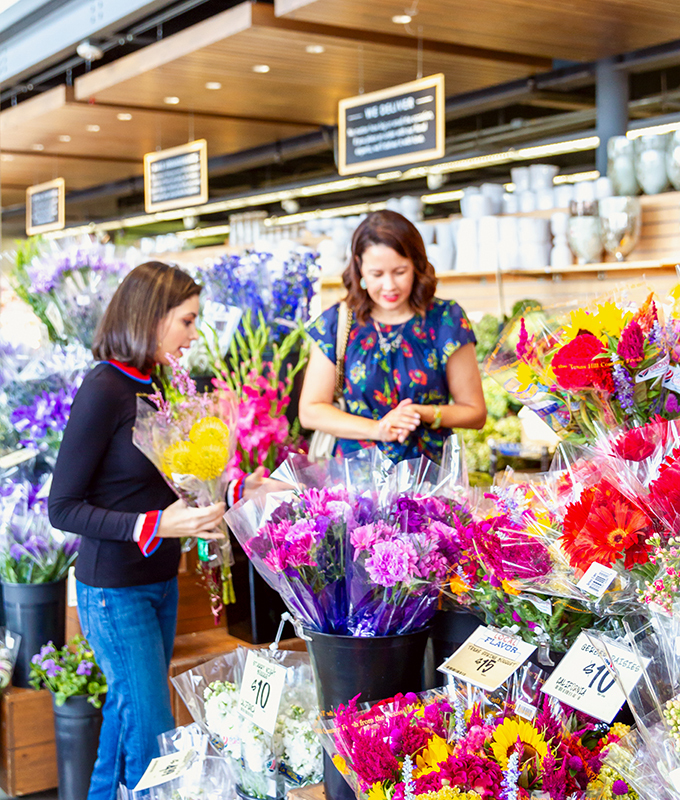 The colors, the fragrances, the natural beauty — each of these elements individually and collectively up our happiness factor. In fact, I’ve been recently impressed by a close friend of mine. 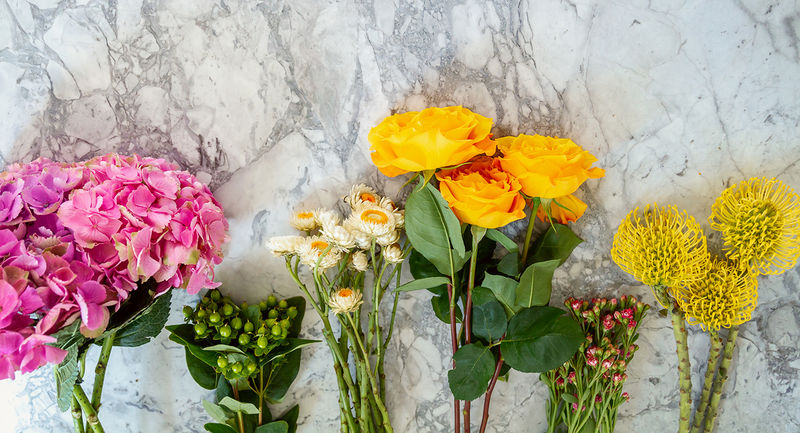 Each time I go to her house, she has a vase of fresh flowers in every room of her house downstairs. This isn’t something that she does only for special occasions when she is having house guests. Rather, it’s a weekly treat for herself. 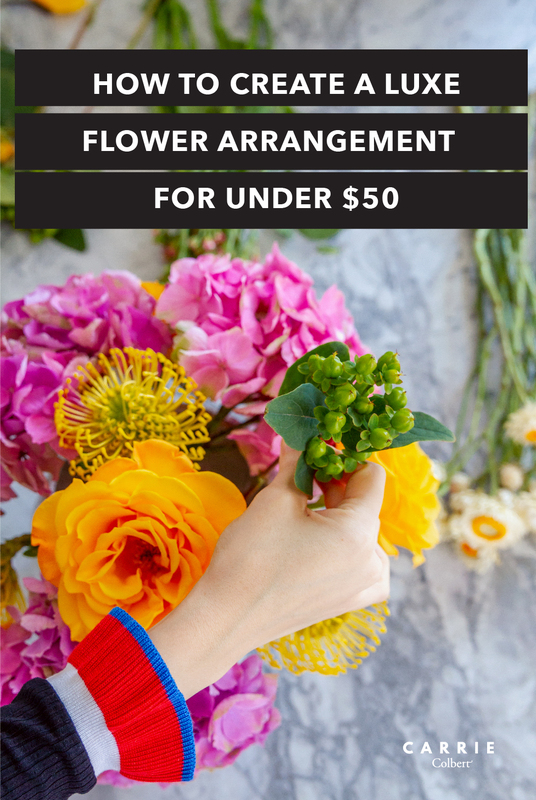 And before you object that flowers are expensive, I’ll quote her funny quip: “I figured that spending $100 on flowers each month is way less expensive than therapy!” We can all laugh at that and simultaneously appreciate the bit of truth in it. 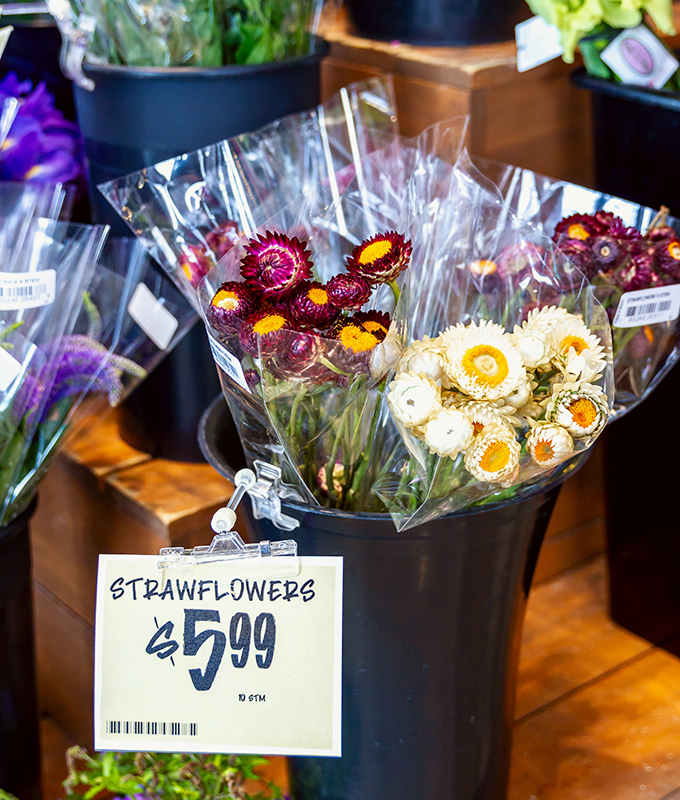 When I buy flowers, however, they never seem to look quite so cheerful. Some people have that natural knack for floral arrangement, but mine look a little awkward and sad sometimes. 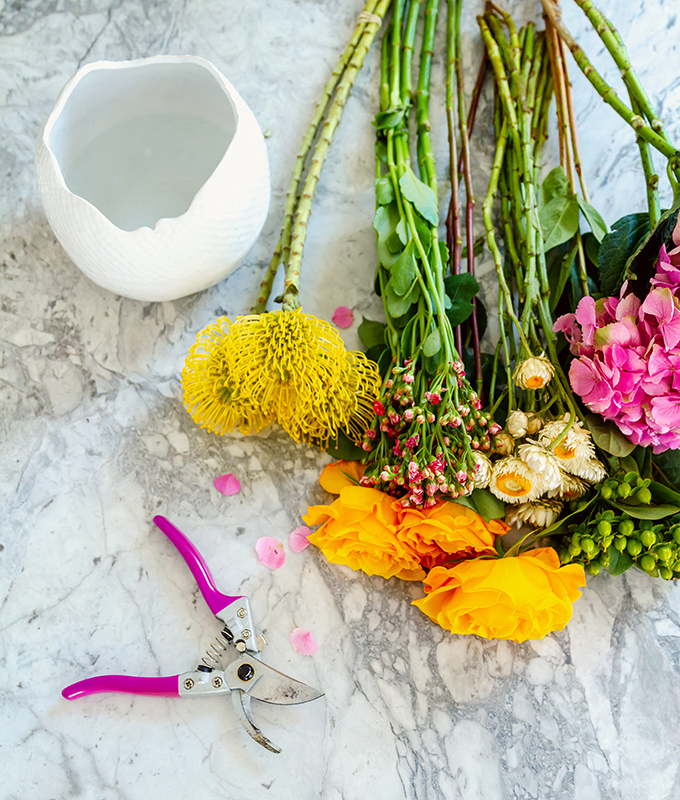 So, in the spirit of embracing happiness, in the spirit of welcoming happiness into my home, and in the spirit of learning a new skill, I asked my friend and local florist Layla from Joy Box Flowers to help me. 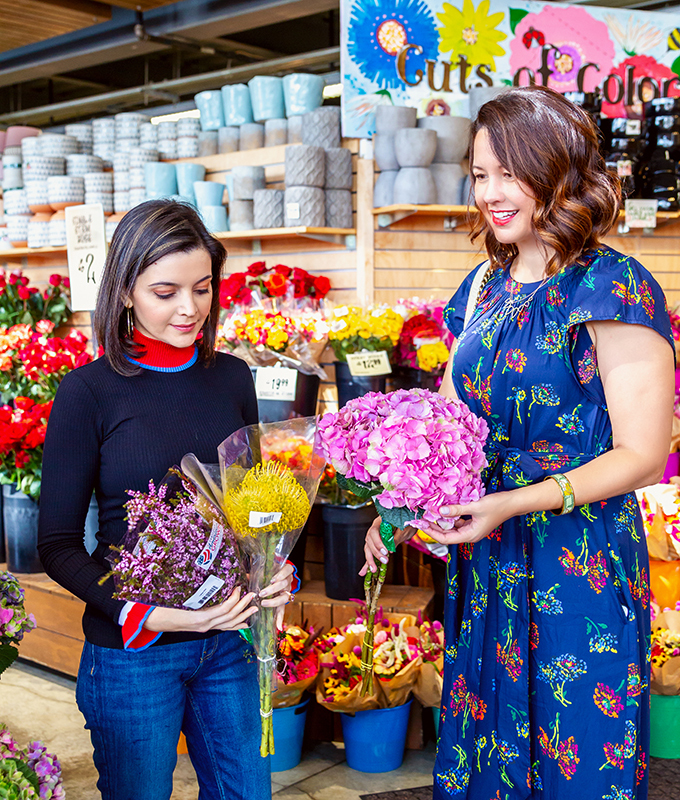 Now, certainly, I wish I could afford her professionally arranged beautiful florals each and every week. But alas that’s not in the budget. 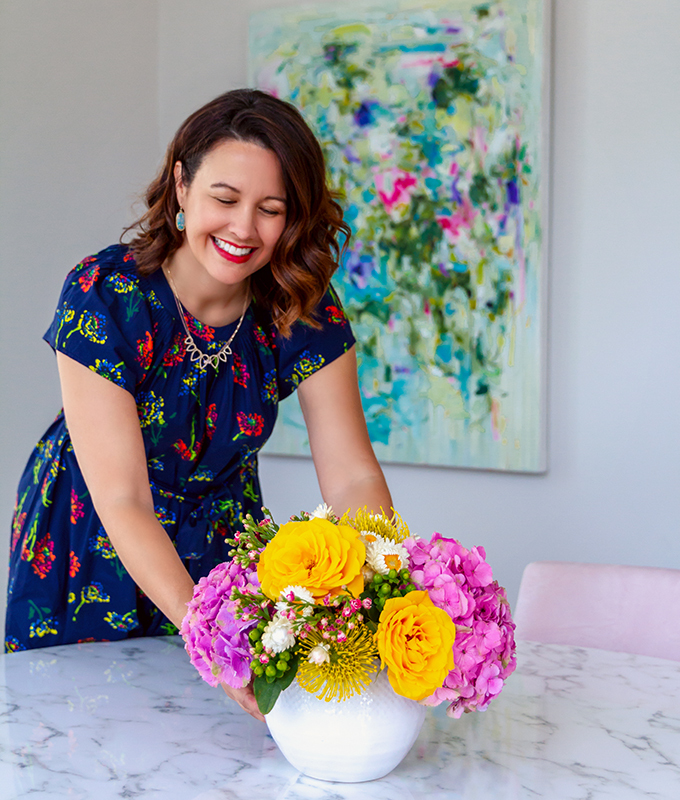 However, she (being self-taught) was more than willing to share her tips and tricks for creating a gorgeous, luxurious floral arrangement at home! Helpful hints: Water should be lukewarm to cool – definitely not hot. 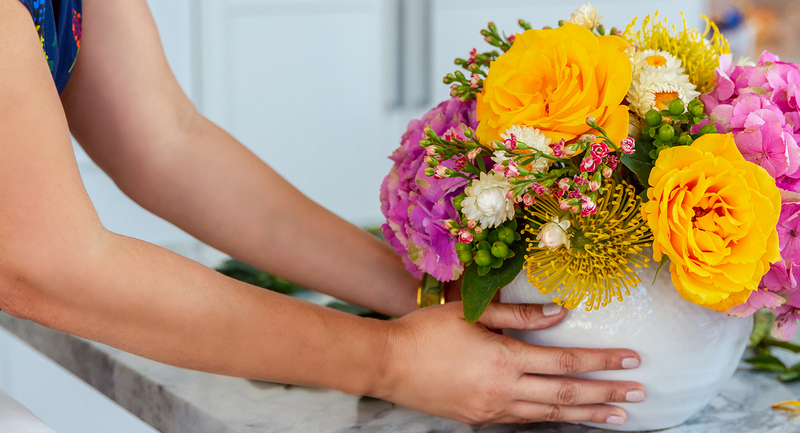 Also, only fill the vase about halfway with water to allow room for the flowers. Helpful hint: Truth be told, I’ve always been skeptical about that powdery substance that often comes with flower purchases. Perhaps it’s been borne out of laziness on my part. But I asked Layla, and she concurred that the food does indeed help the flowers last longer. 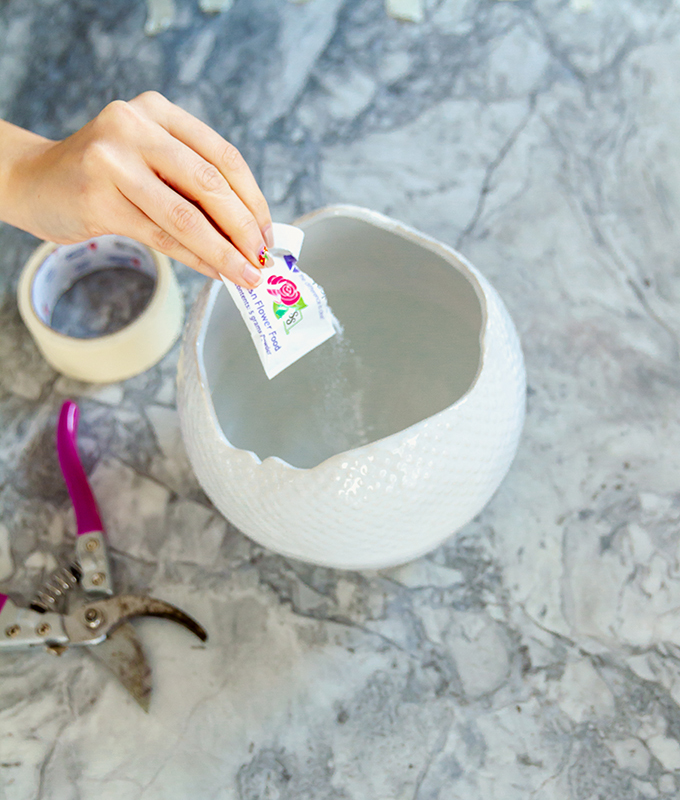 Helpful hint: Masking tape does not work well. These are usually big bushy flowers or greenery (leaves and branches). 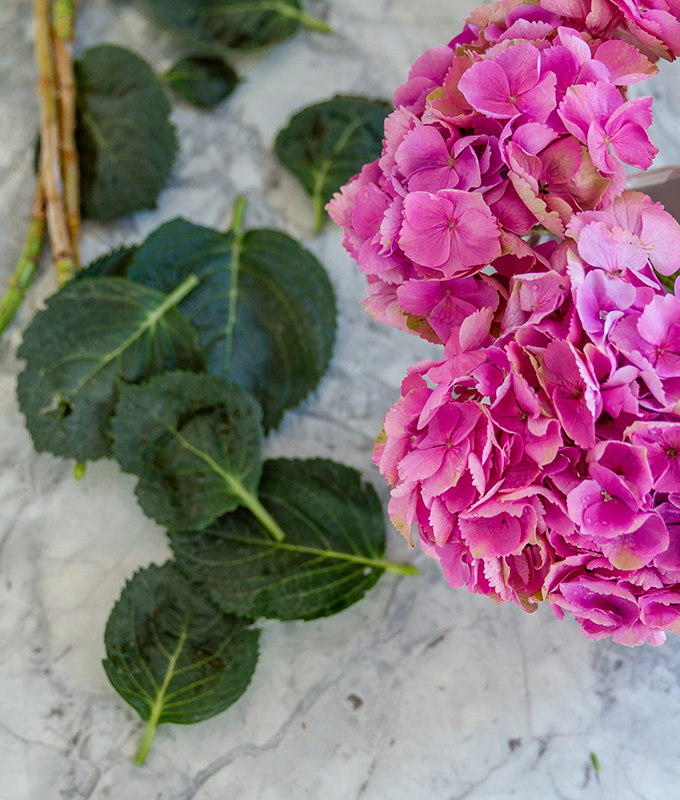 In our case, because we are all about #MoreColorPlease, I chose these vibrant hydrangeas as our base flowers. (1) For all flowers, always take off all of the leaves that will be below the water level. Leaves cause bacteria to grow in the water. 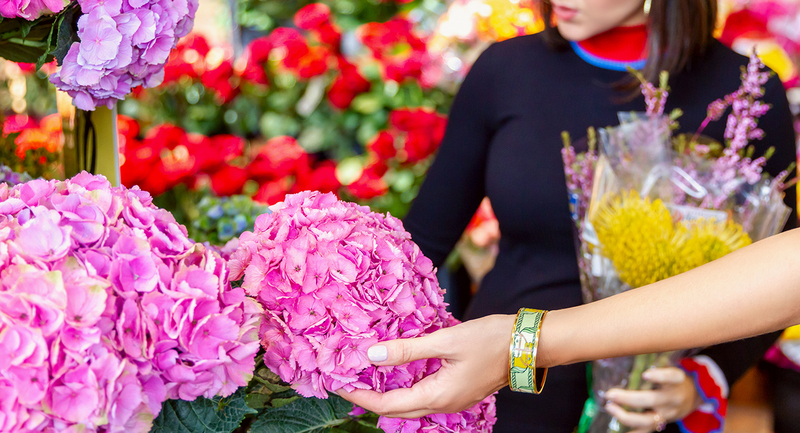 (2) For hydrangeas, if the blooms haven’t been conditioned at the store, be sure to lightly spray them with water. 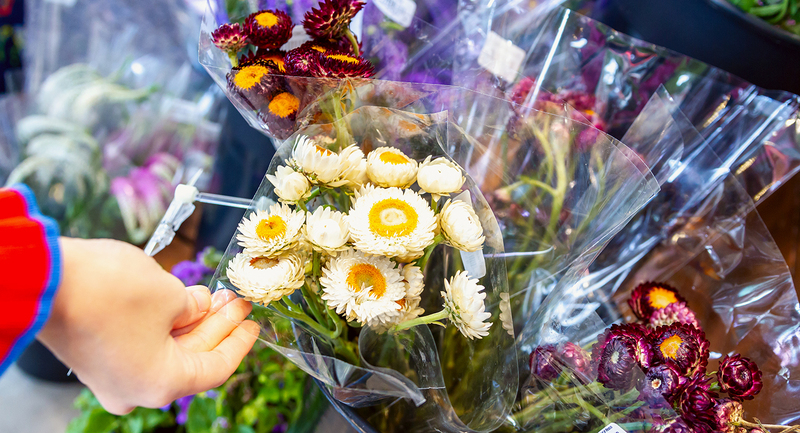 Then, try to spritz them with water everyday to extend their lives. 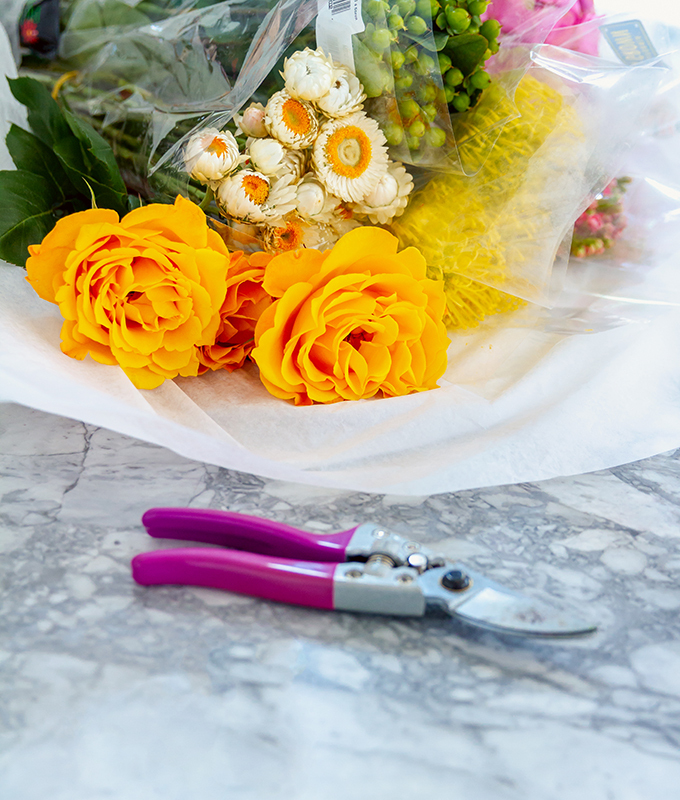 (3) For all flowers, always cut the stems at about a 45 degree angle. This increases the surface area for the flower to take in water. 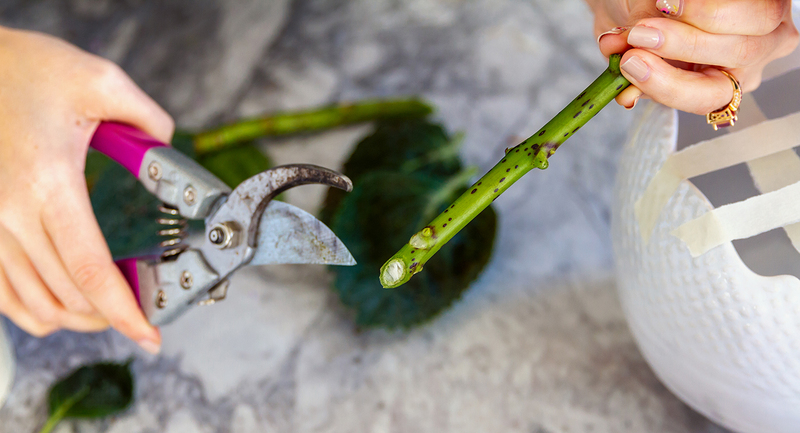 (4) For hydrangeas, in order to facilitate even more absorption of water, make an additional cut vertically up the stem of the flower. 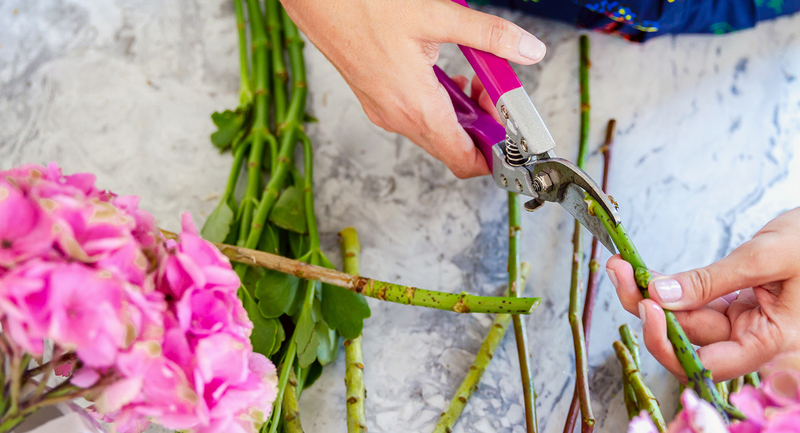 (5) Consider purchasing a pair of floral shears. You’ll get a much cleaner cut than if using regular scissors. I was amazed at the difference! For us, this included the roses. Since these were our feature flowers (or focal flowers), we made sure to position these strategically where the eye would automatically land on them. (1) For roses, take the guard leaves off. These are those outer rose petals that might not look so hot. 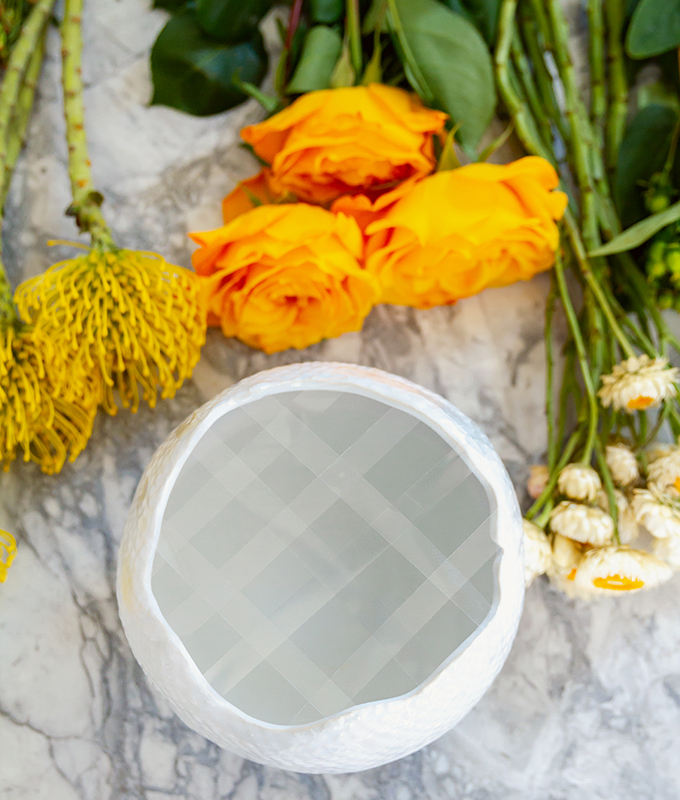 These are purposefully left on the roses while they are in transit to you in order to better protect and preserve them. 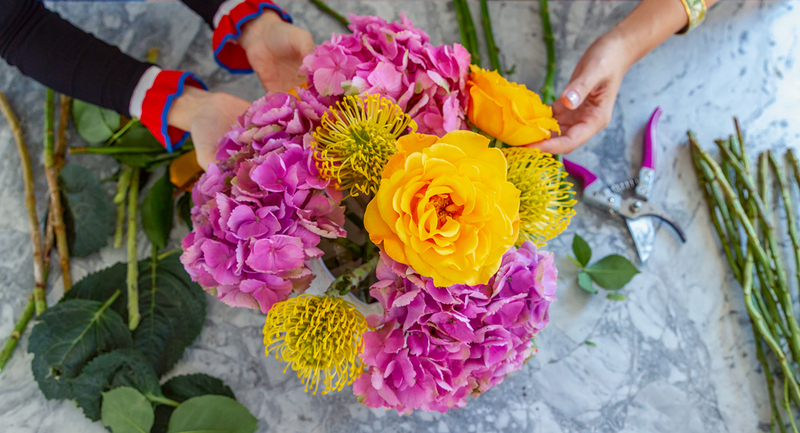 (2) If your roses are still quite closed when you purchase them, you can get them to open up by holding them them upside down between your two hands and twisting them back and forth. 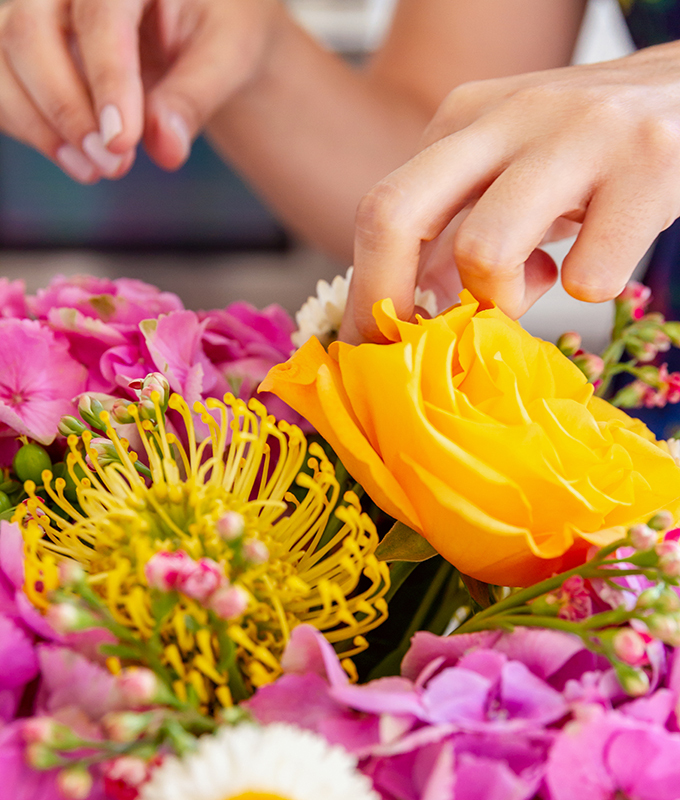 (3) As you are inserting blooms into your vase, be sure that the stem lands in water. 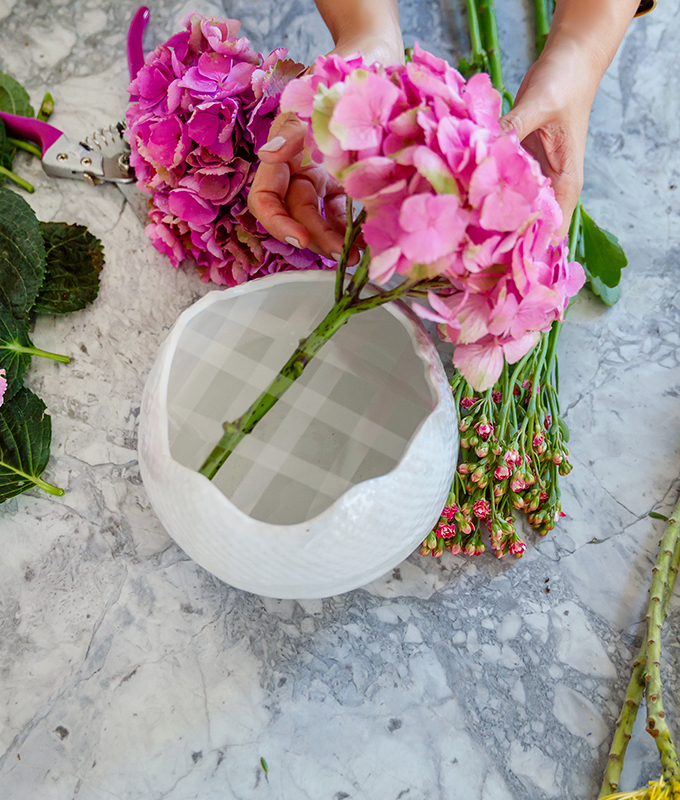 This may seem obvious, but you’d be surprise how tricky it gets as your grid / vase / arrangement gets more filled with flowers. It can get crowded in there! 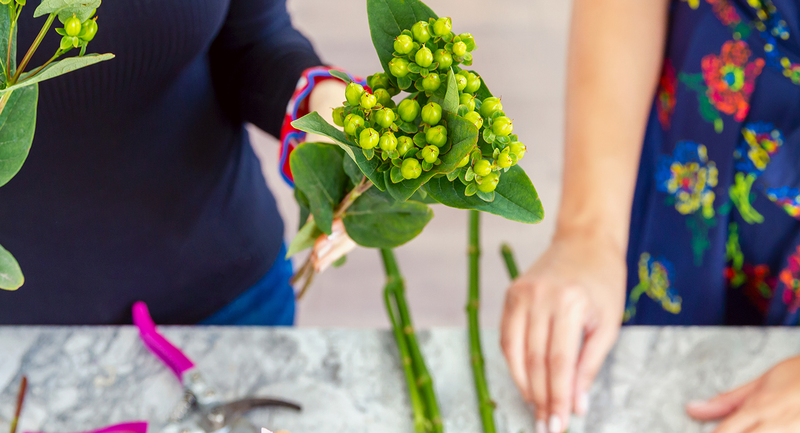 Filler flowers can be anything from baby’s breath to berries. Green berries are quite lovely for fall and winter. In this case, you can leave some of the leaves at the top if they look nice. But as always, make sure you leave no leaves below the water surface. Make sure you move around the arrangement. Look at it from different angles. See if anything is missing. Are there any holes? Are there any similar colors or flowers too close to one another? This part is certainly where the art and creativity skills come in to play! Just You want people’s eyes to move around but you want a resting place. Avoid making anything too busy around your focal point. 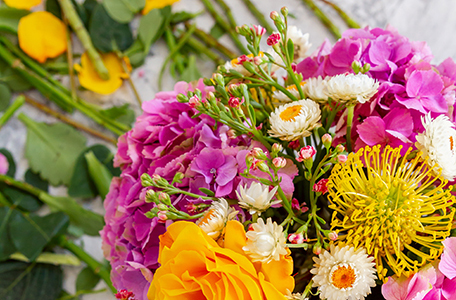 Yes, you want eyes to move around your bouquet. But you also want to provide a resting place for the eyes. So, in our case, Layla encouraged me to keep things less competitive and more complementary around our yellow roses. . Always get extra just in case. 9. Finally, add the finishing touches. At this point, you might think you’re finished. And you very well may be! But try to add that figurative cherry on top. 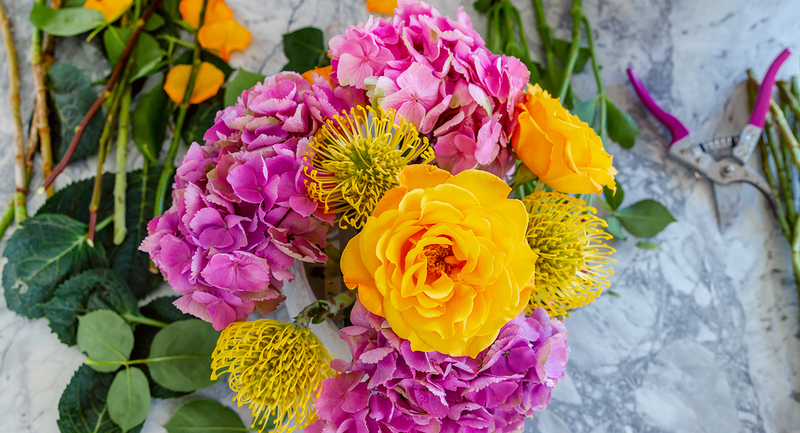 This can be a fun, unexpected element that adds personality to the bouquet. This final touch with polish off the arrangement perfectly. 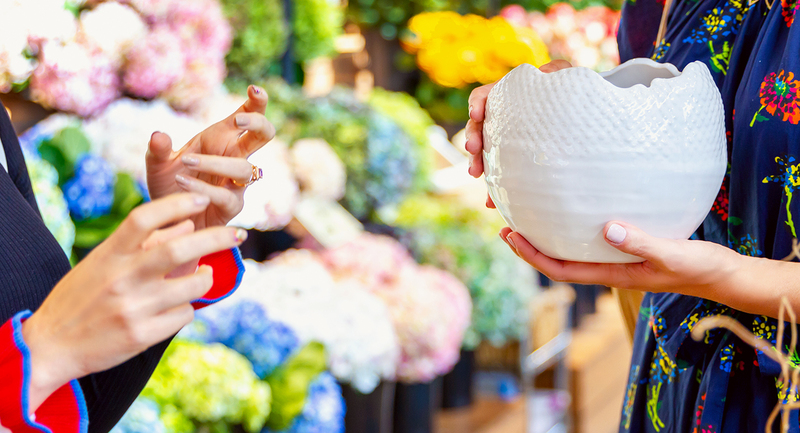 Helpful hint: Always buy a little more than you think you’ll need. 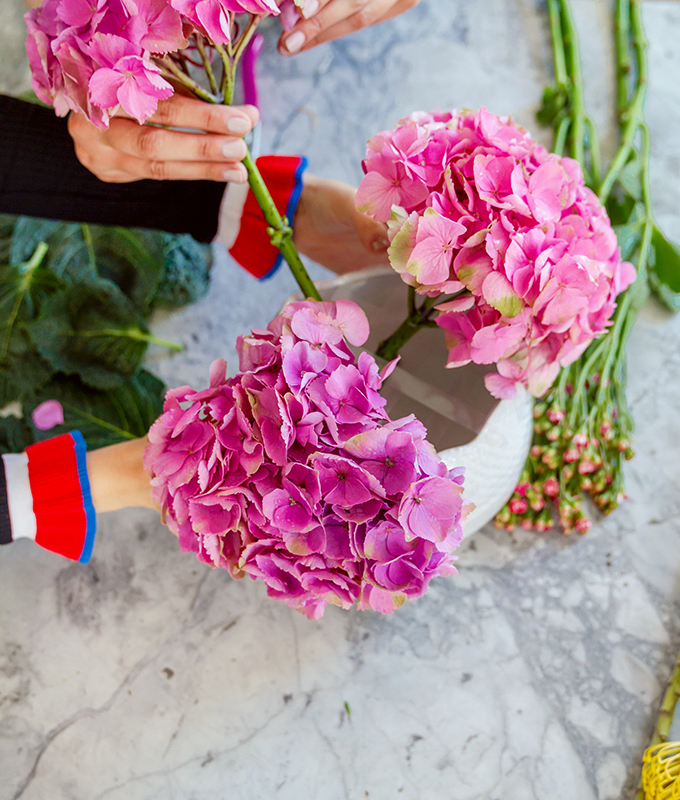 In our case, Layla (the perfectionist and professional) kept yearning for just one more hydrangea. But c’est la via. Well, what do you think? Can you believe we made this for only $50? I was so proud of the end result! The final product was beautiful, and it did indeed add happiness to my home. I definitely now feel equipped and ready to make a habit out of this. 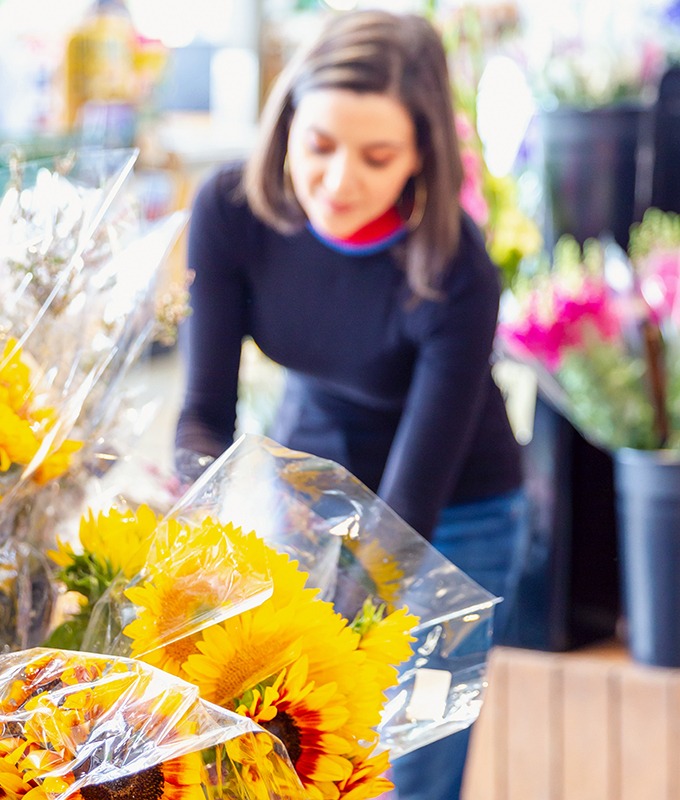 Do you have any tips for creating at home floral arrangements with grocery store flowers? If so, we’d love to hear in the comments below! And if you create one using these tips, please share and tag #morecolorplease so we can see! 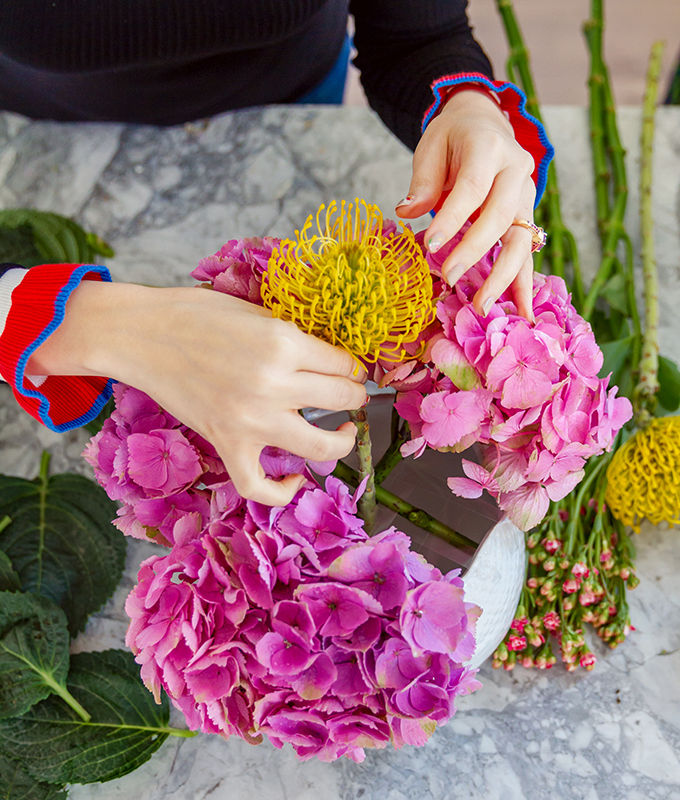 You might remember these photos we shot at Joy Box Flowers a few weeks back. It’s truly such a beautiful, happy place. If you’re here in Houston, go check it out! 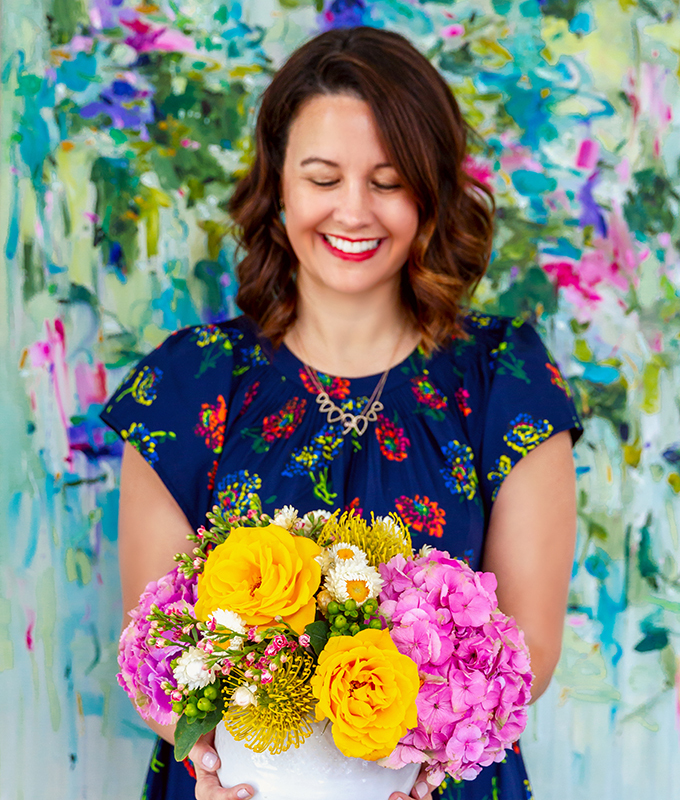 We are so impressed with Layla, her talents, and her beautiful studio space. 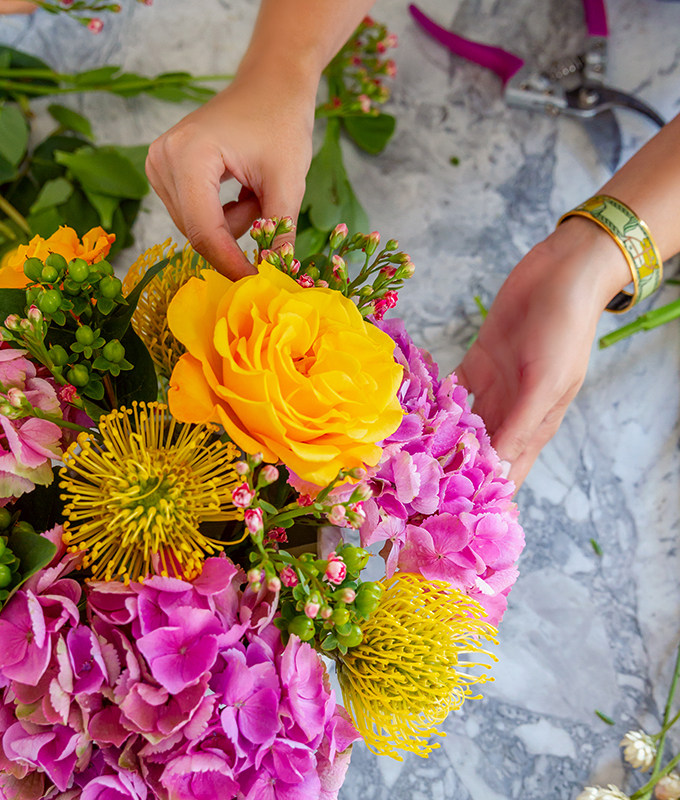 Thank you so much again to Layla of Joy Box Flowers for sharing your expertise! 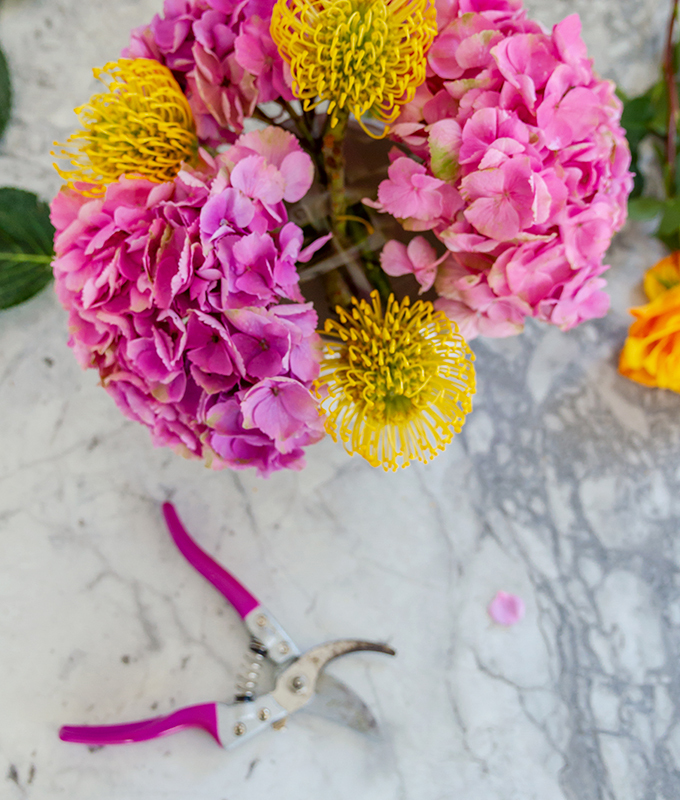 Some great tips — especially about those floral shears! I’m glad you liked it, Sheri! Yeah – I ordered myself some right away for myself. 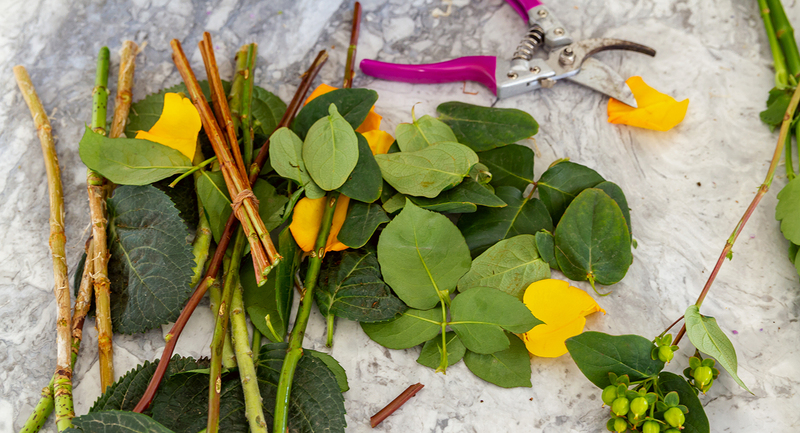 I always knew you were supposed to cut the stems, but I would kind of mangle them even with the sharpest of scissors. Eek! Ali Edwards shares how one word can transform your entire year.